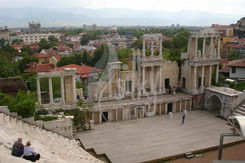 The annual art festival in Plovdiv will be held between 1 � 30 September in the picturesque houses of Old Town. Bulgarian artists aged between 25 � 40, among which Kaliya Kalacheva, Alexander Petkov, Darina Peeva, Dimitar Genchev, Eleonora Drumeva, Zina Nedelcheva, Lora Aprmakova, Lyubomir Krastev, Nina Ruseva, Stoyan Dechev, and others will be the main focus of the event. A general art curator � Ms Galina Lardeva - will decide the conceptual and technical parameters of all exhibitions. A bilingual catalogue with reproductions of many of the paintings, as well as articles about every artist will be available across all the exhibition art spaces.